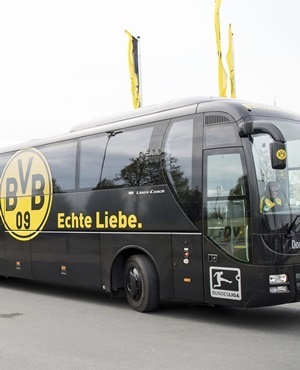 A team bus arrives at the training grounds of Borussia Dortmund in Germany. (Marius Becker, dpa via AP). German police have arrested one of the suspects that masterminded a bomb attack on Borussia Dortmund’s team bus. This piece of news should delight fans, management and players of Dortmund Football Club. The person allegedly responsible for the bomb attack on their team bus last week has been arrested. The 28-year-old German-Russian national, Sergej W. arrested by a German federal anti-terrorist unit in the state of Baden-Wurttemberg on Friday. He has been charged with attempted murder, causing an explosion and aggravated battery, an official press release said. The Federal Prosecutor's office in Germany says the man is suspected of having acted for financial reasons and had speculated on Dortmund's share value dropping after the attack. The suspect was said to have booked a room in Dortmund's team hotel from April 9 through to April 13 and April 16 through to April 20, the time-frame during which a second leg would have been played at Dortmund had their Champions League quarterfinal draw necessitated it. The Federal Prosecutor's office in Germany added that the three blasts detonated at the time the bomber had intended, but that the second blast occurred around one metre above the ground, limiting the damage. The bombs were filled with metal pins around 70 millimetres long, with one pin found 250 metres away from the blast.